Please find the contact details on our website and you can check our updated conference speaker list and register for our conference online. Registrations are now open for the Great Russell Conference held 18-19 May. Early bird registrations close 20th March. All early bird registrations will enter a draw for five free registrations - so be in quick! The team at Mobile Health is running a FREE Rural Emergency Skills course on Friday the 17th May 2019. This is open to 6 doctors and 6 nurses for the day lead by Dr Peter Freeman ED specialist. 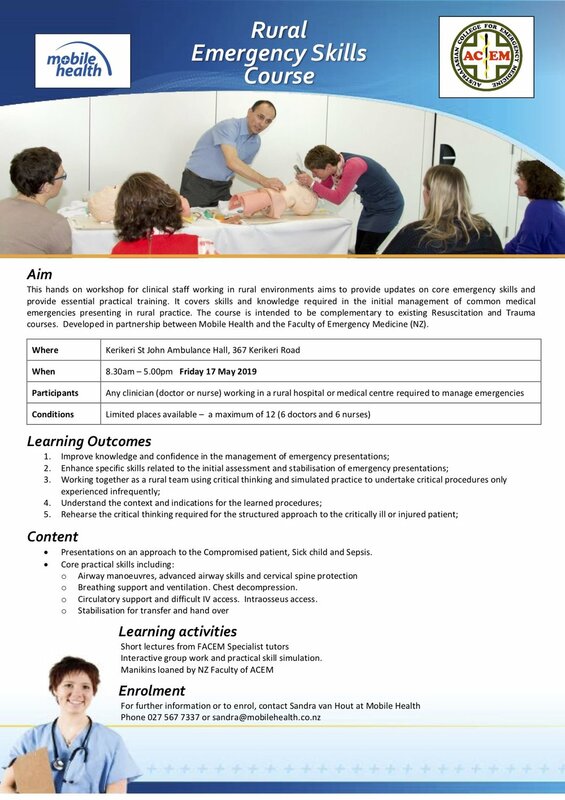 Contact Sandra (sandra@mobilehealth.co.nz) if you can make that Friday free to participate in this hands on workshop that covers skills and knowledge required in the initial management of common medical emergencies. After that, join us in Russell for a warm up at the Duke of Marlborough hotel before The Great Russell Conference on Saturday 18th and Sunday 19th May 2019. Check out our registration page for this years line up and go into the draw for a free conference if you register early. This year our Saturday night dinner entertainment will be the trivial mind of Dr Cunningham testing the depths of our knowledge, so brace yourselves! Don't forget to register for our symposium 'MedNZ Talks' being held in Kaitaia this year Saturday 3rd November. All involved in primary care are welcome to attend so forward our link on to your colleagues, practice managers, nurses, health workers and pharmacists. Also the Northland faculty has purchased a projector and screen for our educational meetings. If members are presenting to community groups in Northland in a non-profit making capacity they are welcome to borrow this equipment. Please contact the Faculty. This year, on 3rd November, the Northland Faculty is pleased to present the annual spring symposium in Kaitaia at the amazing Te Ahu centre. Join fellow primary health care professionals from around Northland to learn from fellow colleagues and enjoy each others company. Topics include registrar audits, physio solutions for common problems, anaesthetic pain procedures, managing the long list of medications in renal patients, plant based diets, sudden dependence in older age, managing a relationship with the police, how to write a novel, travel medicine tips, insights from a designated doctor and harrowing histories in medicine. This week the Northland Faculty will not only be co-hosting the college conference in Auckland, but we will be working with NorthlandInc to promote our region. Conference attendees will be encouraged to visit our stand and answer an online quiz about our region to be in to a draw to one of three Northland prize packs to the total of $5000. A great weekend was had by over 95 GPs, registrars and students at the Great Russell conference on the 19th and 20th of May. Photos from the conference and some presentations are able to be viewed on our website. Register for The Great Russell Conference! Here is the link to our website for the registrations and list of speakers. We hope that Burton Shipley will make for an interesting after dinner speaker at the Saturday night dinner. Your Faculty Board informally meet at the bar on Friday night, so see you there. The Really Great Russell Conference is being held 19-20 May. Don't forget to register at this link. The Kapa Kaiaka group was lucky enough to host Dr. Orna McGinn, from Auckland, for an evening of education regarding long acting reversible contraceptives. This was held at Te Whare Ora O Tikipunga and thirteen Kapa Kaiaka GPs from throughout Northland attended the evening. The goal of the session was to become more informed about the use of LARCs and have some skills based teaching regarding insertion of Jadelles, Mirena, and Copper IUDs. The session started with teaching by Orna and then there was opportunity for practice on models provided by Anton Garrido of Bayer. After the session we have endeavoured to match Kapa Kaiaka trainees with GPs who are already experienced in inserting IUDs and Jadelles in order to gain some supervised experience. There is a lack of a standardised training protocol for LARC insertions in NZ and Orna is instrumental in attempting to get one up and running, so we were very lucky to benefit from her expertise. Obviously a major barrier to LARC access for patients is the availability of GPs who are able to perform their insertions, so hopefully this session will enable a newer cohort of GPs to start learning these skills and increase patient access to LARCs in the future. Herald in the summer with the GP/Consultant meet and greet evening, canapes and bubbles! Whangarei Cruising Club, Riverside Drive 9th November 7-10pm. The last day for registrations for the Homegrown symposium is Monday 23rd October. Click this link to register today. Four Safe Hands, Safe Plans free RHANZ workshops for Northland from the 31st October. Our Northland GP registrars are presenting practice changing quality audits at the Homegrown Treasures Symposium, Maunu, 28th October 2017. Click this link to register. The cost is only $69 (free for registrars). Our local specialists in orthopedics, cardiology and oncology will present along side our registrar audits. You will have a chance to hear from Mike Roberts and discuss urgent care access with a panel of local GPs who have been doing some work on access and urgent care in their clinics. Seasons Cafe will be presenting lunch, The Coffee Man will indulge your caffeine needs and the Medical Museum will be open for viewing. The Northland Faculty RNZCGP would like to invite Northland GPs, Practice Managers, Practice Nurses and Pharmacists to their annual symposium - Homegrown Medical Treasures on the 28th October. This will be hosted at the Vintage Car Club, Kiwi North, Maunu so that attendees can take the opportunity to enjoy the treasures of the Medical Museum during morning tea and lunch. New specialists from the hospital will present in the morning along with the popular registrar audits. This will be followed by an afternoon workshop session on urgent care provision. You can register by clicking this link We look forward to seeing you there.